The kitchen is one of the most important rooms in the house and it is essential to have every thing organised and easily accessible. There's nothing worse than being in the middle of cooking something and you can't find the lid to the saucepan! 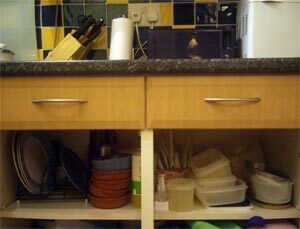 One solution to that would be to fix a rack/pot lid organiser inside one of your kitchen cupboard doors to house the lids and you'll never have to rumage through your cupboard again to find that lid. Below are a few tips I've found to help re-arrange your kitchen and make life easier. Many a time I have gone in to my utensils drawer to find something and have ended up cutting myself on a sharp knife! Not any more, I bought a knife block and store all my knives in that - no more blood stains in the drawer! I remember when I first moved in with my boyfriend and apart from most of the cupboards being empty I noticed that all his cutlery was in one drawer. So I went out and bought him one of those cutlery trays as I can't stand things not being organised! One of my pet hates is having lots of plastic containers of different sizes that do not stack, take up lots of space in the cupboard and you can never find the correct lid for the container you're using. Sound familiar? Well, I stumbled across an ingenious idea in the Kleeneze or Betterware catalogue, it's basically a revolving carousel which is split in to four sections and comes with different sized containers and lids that stack and fit very neatly within this. On a last note, check out the Kleeneze or Betterware catalogues as they are full of clever ideas on getting organised in the kitchen and making it less cluttered.